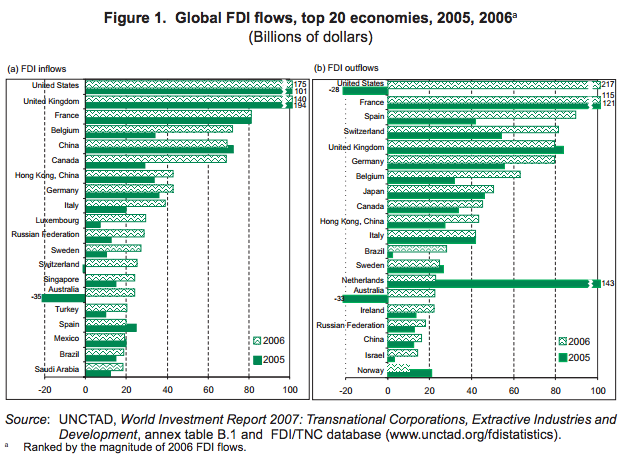 For the third consecutive year, global FDI inflows rose in 2006 – by 38% – to reach $1,306 billion. This was close to the record level of $1,411 billion reached in 2000, and reflects strong economic performance in many parts of the world. The growth of FDI in 2006 occurred in all three groups of economies: developed countries, developing countries and the transition economies of South-East Europe and the Commonwealth of Independent States (CIS). The rise in global FDI flows was partly driven by increasing corporate profits worldwide and resulting higher stock prices that raised the value of cross-border mergers and acquisitions (M&As). M&As continued to account for a high share of FDI flows, but greenfield investment also increased, especially in developing and transition economies. As a result of higher corporate profits, reinvested earnings have become an important component of inward FDI: they accounted for an estimated 30% of total inflows worldwide in 2006 and for almost 50% in developing countries alone. While FDI inflows in developed countries rose by 45% – well over the rate of the previous two years – to reach $857 billion, flows to developing countries and the transition economies attained their highest levels ever: $379 billion (a 21% increase over those in 2005) and $69 billion (a 68% increase) respectively (table 1). The United States regained its position as the leading host country, followed by the United Kingdom and France (figure 1). The largest inflows among developing economies went to China, Hong Kong (China) and Singapore, and among the transition economies to the Russian Federation. Developed-country TNCs remained the leading sources of FDI, accounting for 84% of global outflows. While there was a rebound of FDI from the United States, almost half of world outflows originated from European Union (EU) countries, notably France, Spain and the United Kingdom in that order. 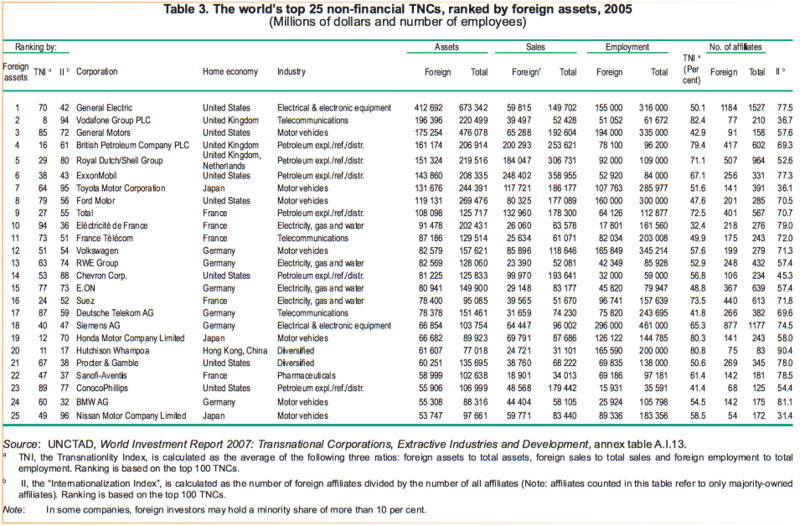 TNCs from developing and transition economies continued their international expansion in 2006, led by Hong Kong (China) in the former group of economies and the Russian Federation in the latter. Total FDI outflows from these groups of economies reached $193 billion, or 16% of world FDI outflows. Increased cross-border M&A activity supports the current rise in global FDI. Such transactions rose significantly in 2006, both in value (by 23%, to reach $880 billion) and in number (by 14% to 6,974), approaching the previous M&A peak in 2000. This growth was driven by higher stock market valuations, rising corporate profits and favourable financing conditions. In contrast with the M&A boom of the late 1990s, this time transactions have been predominantly financed by cash and debt, rather than through an exchange of shares. As many as 172 mega deals (i.e. deals worth over $1 billion) were recorded in 2006, accounting for about two thirds of the total value of cross-border M&As. These transactions were widely spread across regions and sectors. In North America, due to several deals in the mining industry, cross-border M&As almost doubled. In Europe, the United Kingdom was the main target country, while Spanish companies were very active as acquirers. Cross-border acquisitions by Spanish companies (e.g. Telefónica and Ferrovial) were valued at $78 billion, a record level for that country. Companies from developing and transition economies have also been increasingly engaged in such transactions, the largest in 2006 being the $17 billion acquisition of Inco (Canada) by CVRD of Brazil. Another noticeable trend in global M&A activity has been the growing importance of private equity funds and other collective investment funds. In 2006, they were involved in cross-border M&As valued at $158 billion, an 18% increase over 2005. A growing appetite for higher yields and ample liquidity in world financial markets helped fuel these acquisitions. Private equity firms are increasingly acquiring large listed companies, in contrast to their former strategy of investing in high-yield, high-risk assets, and they are likely to continue to play a prominent role in M&A transactions. However, this scale of activity may not be sustainable due to a number of factors: competition is intensifying and the asset prices involved in recent acquisitions have increased substantially; there is also a possibility that the favourable fiscal treatment such firms enjoy in some countries may not last. Investments by private equity firms are often more akin to portfolio investment than to FDI, in that they tend to have relatively short time horizons. This has raised some concerns regarding the impact of such investments, in particular as regards the dismantling of the acquired companies and worker layoffs. As cross-border M&As by private equity firms are a relatively recent phenomenon, more research is needed to better understand their impact. … and resulting in further growth of international production. The production of goods and services by TNCs outside their home countries grew more rapidly in 2006 than in the previous year. The sales, value added and exports of some 78,000 TNCs and their 780,000 foreign affiliates are estimated to have increased by 18%, 16% and 12% respectively (table 2). They accounted for the equivalent of 10% of world GDP and one third of world exports. China continued to host the largest number of foreign affiliates in the world, while the growth rate of the number of TNCs from developing countries and transition economies over the past 15 years has exceeded that of TNCs from developed countries. Employment in foreign affiliates of TNCs has increased nearly threefold since 1990, although at a slower pace than FDI stock. Foreign affiliates in China had the largest number of employees: 24 million as estimated by the country’s Ministry of Commerce. Between 2001 and 2004, employment in foreign affiliates in the United States shrank to 5.1 million, representing a reduction of half a million. In comparison, reflecting the fact that United States firms are by far the largest direct investors abroad, their foreign affiliates created the largest number of jobs (9 million) among foreignaffiliates of all home countries. The employment impact of FDI in host economies varied by region, but for a given amount of inward FDI more jobs were created in developing and transition economies than in developed countries. As in previous years, services accounted for the bulk of world inward FDI stock in 2005 – nearly two thirds – compared with 49% in 1990. Within services, the share of infrastructure-related industries rose in both absolute and relative terms. Manufacturing was the second largest sector, but its share declined from 41% in 1990 to 30% in 2005, while the share of the primary sector was less than 10% of world inward FDI stock. The share of extractive industries in total FDI increased somewhat between 2000 and 2005, having been on the decline since the Second World War. This rebound was fuelled by new investments in mineral exploration and extraction, as well as by a number of large cross-border M&As (see Part Two). TNCs from emerging economies continue to expand overseas. While the universe of TNCs is dominated by developed-country firms, the picture is changing. The number of firms from developing economies in the list of the world’s 100 largest non-financial TNCs increased from five in 2004 to seven in 2005 (the most recent year for which data are available), in line with the rise of TNCs from the South. Rankings in the list of the world’s top 100 TNCs have remained relatively stable, with General Electric, Vodafone and General Motors having the largest foreign assets (see table 3, which lists the top 25 non-financial TNCs). 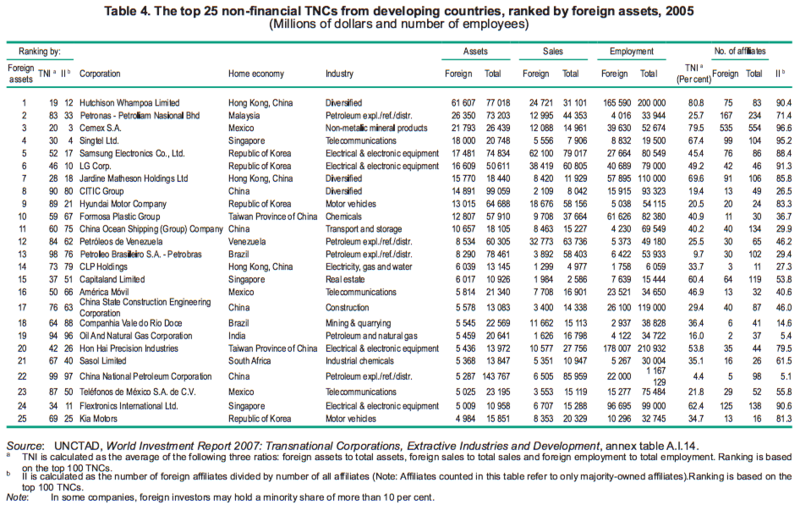 Although the foreign assets of the top 100 TNCs have remained virtually unchanged since 2004, their foreign sales and employment increased by about 10%. Large TNCs from emerging economies are internationalizing particularly fast. In 2005, the foreign sales and foreign employment of the top 100 TNCs from developing economies increased by 48% and 73% respectively. However, these TNCs are still significantly less transnational in their reach than the world’s top 100, with a presence in fewer countries abroad. Asia dominates the list of the 100 largest developing-country TNCs (see table 4 for the top 25 non-financial developing-country TNCs), with 78 firms, followed by 11 each from Africa and Latin America. These TNCs operate in a broader range of industries than the largest TNCs from developed countries. As in previous years, the single most important industry in 2005 was electrical/electronic equipment, especially for a large number of companies from Asia. The geographical pattern of FDI is changing, with greater South-South FDI flows. The geographical pattern of FDI is showing signs of change, with new countries emerging as significant host and home economies. The rise of FDI from developing and transition economies and the growth of South-South FDI are important recent trends. Changes are taking place in the pattern of bilateral flows of FDI as well. In 2005, the largest bilateral outward FDI stock was that of the United Kingdom in the United States – at $282 billion (table 5); 20 years earlier, it was the reverse. 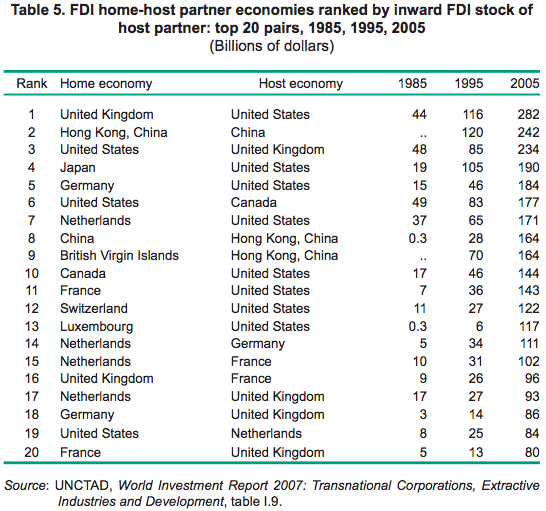 Whereas bilateral links between selected economies, such as those between the United States on the one hand and Canada, the Netherlands and the United Kingdom, on the other, dominated the global picture of bilateral FDI relationships in 1985, today, the situation is considerably more multifaceted, reflecting the involvement of many more countries in international production. With strengthening relationships between countries within the same region, and the emergence of many developing countries as sizeable investor economies, geographical proximity is becoming increasingly important in bilateral FDI relations. For example, in the top 50 pairs of countries with the largest bilateral inward stock, 22 were from Europe in 2005, compared to 17 in 1995. FDI relationships between two economies can be further examined on the basis of the intensity of FDI, which compares the actual volume of bilateral FDI stocks with what would be “expected” on the basis of the share of each economy in global inward and outward FDI. Such a measure shows that the United States has a stronger-than-average FDI intensity with Canada, European countries with each other, and Japan with Asian countries. It also shows that SouthSouth relationships have strengthened over the past decade, especially in the Asian region. Most policy changes continue to favour FDI, though some restrictions have emerged in certain industries. Governments continue to adopt measures to facilitate FDI. 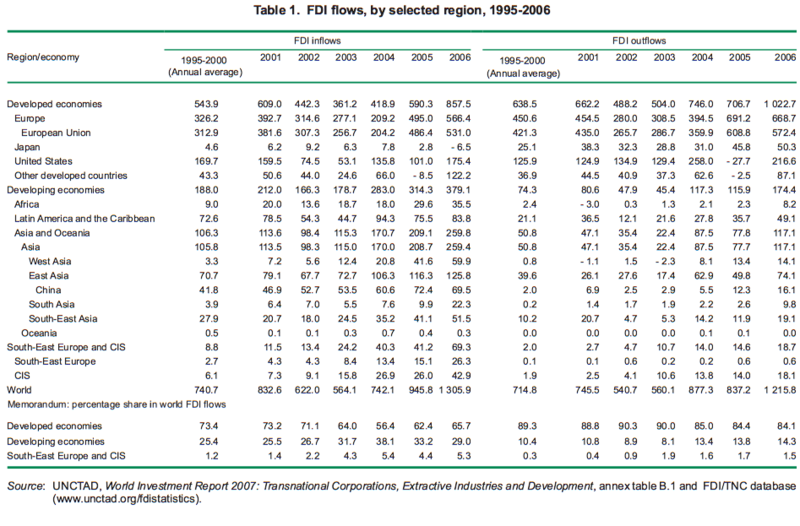 In 2006, 147 policy changes making host-country environments more favourable to FDI were observed (table 6). Most of them (74%) were introduced by developing countries. They included in particular measures aimed at lowering corporate income taxes (as in Egypt, Ghana and Singapore) and expanding promotional efforts (as in Brazil and India). Further liberalization of specific industries is under way in various countries, such as that relating to professional services (Italy), telecommunications (Botswana and Cape Verde), banking (the Lao People’s Democratic Republic and Mali) and energy (Albania and Bulgaria). In some industries, however, new restrictions on foreign ownership or measures to secure a greater government share in revenues were observed. Such steps were the most common in extractive industries and in industries deemed to be of “strategic” importance. For example, in Algeria, State-owned oil and gas enterprises must now hold a minimum of a 51% stake, and in Bolivia, by signing new contracts TNCs have returned ownership of petroleum reserves to the State oil company. In the Russian Federation, foreign investment is to be restricted in “strategic sectors” such as defence and extractive industries, with only minority stakes permitted in the latter. In Venezuela, nationalizations in the “strategic sectors” of energy and telecommunications are in progress. The perception that these and other changes might trigger renewed protectionism has led to some concern. However, as in 2005, the trend appears to be confined to a relatively small number of countries, and to specific industries. The number of international investment agreements (IIAs) has continued to grow, reaching a total of almost 5,500 at the end of 2006: 2,573 bilateral investment treaties, 2,651 double taxation treaties and 241 free trade agreements and economic cooperation arrangements containing investment provisions. The number of preferential trade agreements with investment provisions has almost doubled in the past five years. Developing countries are becoming increasingly important participants in international investment rule-making, partly reflecting growing South-South FDI. FDI in Africa peaked, as its resources attracted increasing FDI. At $36 billion in 2006, FDI inflows in Africa were twice their 2004 level. This was due to increased interest in natural resources, improved prospects for corporate profits and a more favourable business climate. The value of cross-border M&A sales reached a record $18 billion, half of which represented purchases by TNCs from developing Asia. Greenfield projects and investments in expansion also grew significantly. Despite this increase, Africa’s share in global FDI fell to 2.7% in 2006, compared with 3.1% in 2005, much lower than that of other developing regions. FDI outflows from Africa also reached a record $8 billion in 2006, up from $2 billion in 2005. FDI inflows rose in 33 African countries and in all subregions except for Southern Africa. The top 10 host African countries received about 90% of such flows. In eight of them, inflows exceeded $1 billion each. Large cross-border M&As as well as greenfield investments and expansion projects played an important role in the top host countries, particularly Egypt and Nigeria. In Egypt, the leading recipient in the region, inflows exceeded $10 billion, 80% of which were in expansion and greenfield projects in non-oil activities. South Africa witnessed a major decline in inflows due to the sale of a foreign equity stake in a domestic gold-mining company to a local firm, but it generated most of the outflows from Africa. The search for new naturalresource reserves led to increased FDI to African least developed countries (LDCs), amounting to $8 billion, following two consecutive years of decline. As a result, the LDCs accounted for 23% of the FDI inflows to the region – a significant rise over 2005. Of these LDCs, Burundi, Cape Verde, Djibouti, Ethiopia, Gambia, GuineaBissau, Madagascar, Somalia and Sudan saw the largest increases in FDI inflows mainly directed at new oil exploration and mining activities. In 2006, many African countries adopted measures to attract FDI as well as to improve the impact of FDI on their development. Prospects for FDI inflows into Africa remain positive due to persistently high global commodity prices, though some moderation is expected in 2007. FDI inflows to South, East and South-East Asia maintained their upward trend in 2006, rising by about 19% to reach a new high of $200 billion. At the subregional level, South and South-East Asia saw a sustained increase in flows, while their growth in East Asia was slower. However, FDI in the latter subregion is shifting towards more knowledge-intensive and high value-added activities. China and Hong Kong (China) retained their positions as the largest FDI recipients in the region, followed by Singapore and India. Inflows to China fell in 2006 for the first time in seven years. The modest decline (by 4% to $69 billion) was due mainly to reduced investments in financial services. Hong Kong (China) attracted $43 billion in FDI, Singapore $24 billion (a new high), and India $17 billion (an amount equivalent to the combined inflows to that country of the preceding three years). FDI outflows from the region as a whole rose by 60% to $103 billion, with higher investments from all subregions and major economies. Outflows from Hong Kong (China), the largest source of FDI in the region, rose by 60% to $43 billion. China consolidated its position as a major investor, and India is rapidly catching up. Their emergence as important sources of FDI is challenging the dominance of the Asian newly industrializing economies (NIEs) in outward FDI from the region. Resource seeking FDI from China and India continued to increase. In addition, the efforts of Chinese State-owned enterprises and of Indian privately owned conglomerates to acquire strategic assets abroad, as highlighted by the $11 billion acquisition by Tata Steel (India) of Corus Group (United Kingdom and the Netherlands), have led to greater FDI flows from these countries to developed economies. Rapid economic growth in South, East and South-East Asia should continue to fuel growing market-seeking FDI to the region. The region will also become more attractive to efficiency-seeking FDI, as countries such as China, India, Indonesia and Viet Nam plan to significantly improve their infrastructure. During the first half of 2007, the value of cross-border M&A deals in the region increased by nearly 20% over the corresponding period of 2006. Increased FDI outflows from the region are also expected to continue. … while FDI inflows into West Asia continued to climb to unprecedented heights. In 2006, FDI inflows to the 14 economies of West Asia rose by 44%, to an unprecedented $60 billion. Privatization of various services progressed in 2006, and there was an improvement in the general business climate. The region’s strong economic growth has encouraged investment, and high oil prices have been attracting increasing amounts of FDI in oil and gas and in related manufacturing industries. A few mega cross-border M&As and the privatization of financial services made Turkey the largest recipient in West Asia, with inflows of $20 billion. Saudi Arabia was the second largest with $18 billion (an increase of 51% over its 2005 levels), followed by the United Arab Emirates, where the free zones attracted a significant share of its FDI inflows. Services remained the dominant sector for FDI in West Asia, a major proportion of which went to financial services as a result of privatization and liberalization policies of a number of countries in the region. There were also several major deals in the telecommunications industries in Jordan and Turkey. Efforts by the Gulf countries to diversify their production activities beyond oil-related activities succeeded in attracting greater FDI flows into the manufacturing sector. During the first half of 2007, the value of cross-border M&A sales increased by nearly 3% over the corresponding period of 2006. FDI outflows from West Asia rose by 5% to reach a new high of $14 billion in 2006, as a result of the high oil prices and the current-account surpluses of the oilproducing countries. Kuwait accounted for the lion’s share (89%) of the region’s total outward FDI, mainly in the telecommunications industry. The value of cross-border M&As by firms from the region totalled $32 billion, 67% of which involved firms from the United Arab Emirates, the second largest investor from West Asia. In 2006, FDI inflows to Oceania amounted to $339 million, a decline of 11%, and they remained concentrated in the mining industry. Investments also went to onshore fish-processing activities in Papua New Guinea and the Marshall Islands, and to the tourism industry in some economies such as Fiji and Vanuatu. Greenfield investments and reinvested earnings boosted FDI in Latin America and the Caribbean, and outflows hit new records. FDI flows to Latin America and the Caribbean increased by 11%, to $84 billion. If the offshore financial centres are excluded, however, they reached $70 billion in 2006, which was the same level as in 2005. This is in sharp contrast to the soaring FDI outflows, which jumped by 125% to $43 billion (or $49 billion if offshore financial centres are included). Brazil and Mexico remained the leading recipients (with $19 billion each), followed by Chile, the British Virgin Island and Colombia. The stagnation of FDI inflows in the region (excluding the offshore financial centres) hides disparities among different countries: in South America, most of the countries registered strongly positive growth in FDI flows, but this was offset by a significant decline in Colombia and Venezuela. Two features characterized the region’s FDI inflows: greenfield investments became more important than cross-border M&As, and reinvested earnings became an increasingly important component (the largest component in South America alone). Manufacturing again received the largest share of inflows, and the services sector’s share increased slightly. In services, TNCs continued to withdraw from public utilities, mainly from the electricity industry. The primary sector remained attractive due to persistently high commodity prices. FDI outflows were mainly targeted at extractive industries, followed by resource-based manufacturing and telecommunications. Brazil’s outward FDI was the largest in the region, at $28 billion – its highest level ever – exceeding for the first time its inward FDI. This was mainly due to the above-mentioned purchase of Inco (Canadian nickel producers) by the mining company CVRD, the largest transaction ever by a developing-country company. Companies from other countries, especially those from Argentina, Chile, Mexico and Venezuela, are also increasingly seeking to internationalize through FDI. The trend towards greater State intervention continued in 2006, but unlike the previous year when this occurred mainly in the extractive industries, it extended to other industries such as telecommunications and electricity, in particular in Bolivia and Venezuela. In Venezuela, a deal was negotiated with Verizon, AES and CMS (all United States firms) whereby the three firms agreed to divest their assets to the Government, while the Government of Bolivia is planning to take over Empresa Nacional de Telecomunicaciones (Entel), controlled by Telecom Italia. By contrast, the Government of Colombia is proceeding with a programme of FDI promotion and downsizing of the public sector, including in the extractive industries. FDI inflows into Latin America and the Caribbean, excluding the offshore financial centres, are expected to rise moderately in 2007, increasingly driven by greenfield investments rather than by cross-border M&As. FDI inflows into South-East Europe and the CIS grew by 68%, to $69 billion – a significant leap from the inflows of the two previous years. The top five recipient countries (the Russian Federation, Romania, Kazakhstan, Ukraine and Bulgaria in that order) accounted for 82% of the total inflows. Those to the Russian Federation almost doubled to $28.7 billion, while those to Romania and Bulgaria grew significantly, in anticipation of their accession to the EU on 1 January 2007 and due to a series of privatization deals. FDI outflows from the region increased for the fifth consecutive year, to reach $18.7 billion. Virtually all of this outward FDI reflected the expansion abroad of Russian TNCs, especially some large resource-based firms seeking to become global players and some banks expanding into other CIS countries. While the services sector was particularly buoyant because of increased crossborder M&As in the banking industry, the primary sector received higher inflows as a result of soaring demand for natural resources. In some natural-resource-based economies of the CIS, such as the Russian Federation, the State continued to increase its control in strategic industries. In countries of South-East Europe, FDI-related policies continue to be in line with their accession or aspirations to accede to the EU, and with their aim to step up the privatization of State-owned enterprises. FDI inflows in the region are expected to be particularly buoyant in large economies such as the Russian Federation and Ukraine, as well as in the two new EU members (Bulgaria and Romania). 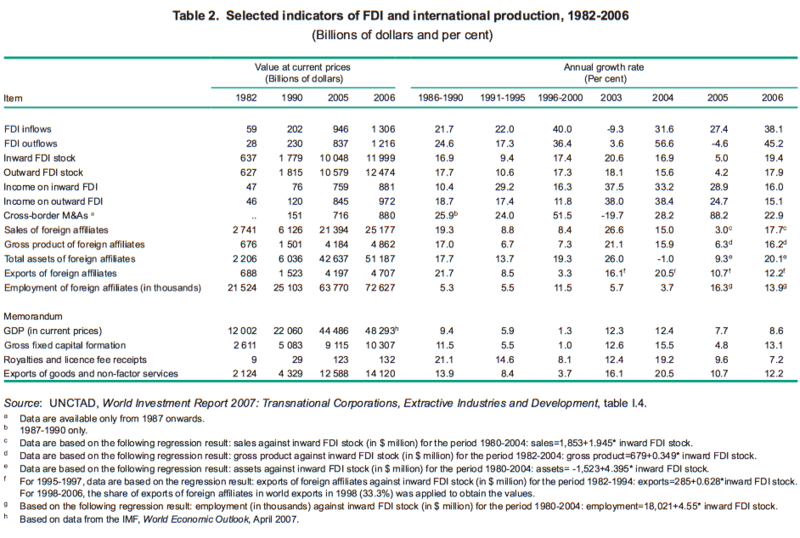 … while the surge in FDI to developed countries was widespread. FDI inflows to developed countries surged to $857 billion – 45% higher than in the previous year – reflecting another rise in cross-border M&As. In contrast to the upward trend of the previous FDI cycle at the end of the past decade, the current increase was widespread, across all the developed regions. FDI inflows to the United States rebounded strongly to $175 billion in 2006, with record flows in the chemical industry, while a wave of cross-border M&As in the mining sector caused Canadian inflows to double, to a record of $69 billion. Inward FDI in the 25 EU countries grew by 9%, to reach $531 billion. Declines in FDI flows to Ireland, Spain and the United Kingdom were more than compensated for by increases in Belgium, Italy and Luxembourg, while inflows in the 10 new EU members amounted to $39 billion – their highest level so far. Due to some large sell-offs of foreign affiliates to Japanese companies, FDI inflows to Japan turned negative for the first time since 1989 (-$6.5 billion). The share of foreign investment from developing countries in the total value of cross-border M&A sales was 9% in 2006 compared to 7% 2005, largely as a result of several mega deals. FDI outflows from developed countries also grew by 45%, to $1 trillion. The United States and five EU countries ranked among the 10 largest outward investor economies in the world. France remained the second largest investor worldwide for the second year in a row ($115 billion), while Spanish companies continued their outward expansion at a rapid pace to reach $90 billion, the largest ever recorded for Spain. FDI outflows from the Netherlands amounted to $23 billion, mainly due to the acquisition of Arcelor (Luxembourg) by Mittal Steel (a company registered in the Netherlands) – the largest deal of the year. While continuous financial deregulation was the main reason for the significant increase in cross-border M&As in financial services, high commodity prices and consolidation efforts spurred such deals in the mining industry. Many developed countries adopted policies that could, directly or indirectly, increase their attractiveness for FDI, although some protectionist sentiment remains or is again on the rise in certain developed countries. The prospects for FDI in developed countries remain bright. Strong economic growth, albeit at a more moderate pace than in 2006, high corporate profits and the upward movement of equity prices are expected to further stimulate cross-border M&As; they had already increased by 66% during the first half of 2007 over the same period in 2006. Overall, prospects for global FDI flows remain positive. The upward trend in FDI is expected to continue in 2007 and beyond – albeit at a somewhat slower rate than in 2006. This would be in line with global economic growth, which should remain above its longer term trend, although it might slow down moderately. This forecast is confirmed by the rise in global cross-border M&As to $581 billion in the first half of 2007 – a 54% increase over the corresponding period of 2006 – and by the results of various surveys. 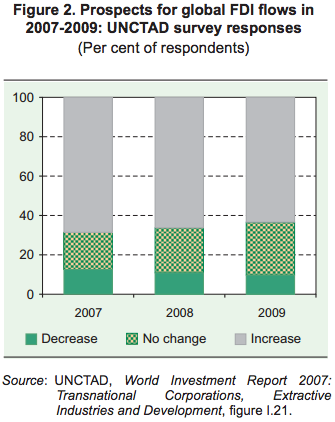 In UNCTAD’s World Investment Prospects Survey, more than 63% of the responding TNCs expressed optimism that FDI flows would increase over the period 2007-2009 (figure 2). According to the survey, the most attractive FDI destination countries are China and India, while East, South and South-East Asia is considered the most attractive region. This is reinforced by several international organizations and research institutes, as well as by another survey conducted by UNCTAD/ WAIPA, in which 76% of the responding CEOs of foreign affiliates expected to continue to increase investments in host economies over the next three years. However, despite the generally positive prospects, several challenges and risks face the world economy, which may have implications for FDI flows in 2007 and 2008. These include global current-account imbalances causing exchange rate shifts, volatile oil prices, and a potential tightening of financial market conditions. Respondents in the UNCTAD survey also expressed some concerns regarding the possible rise of protectionism and of global threats such as terrorism and war. But they believed that the probability of these types of risks affecting the level of FDI in the short term was relatively low. Nevertheless, these considerations underline the need for caution in assessing future FDI prospects. Global FDI flows approach their 2000 peak level … ... driven by cross-border M&As with the increasing involvement of private equity funds … … and resulting in further growth of international production. TNCs from emerging economies continue to expand overseas. The geographical pattern of FDI is changing, with greater South-South FDI flows. Most policy changes continue to favour FDI, though some restrictions have emerged in certain industries. FDI in Africa peaked, as its resources attracted increasing FDI. Inflows to South, East and South-East Asia reached $200 billion, and outflows soared … … while FDI inflows into West Asia continued to climb to unprecedented heights. Greenfield investments and reinvested earnings boosted FDI in Latin America and the Caribbean, and outflows hit new records. FDI flows to South-East Europe and the Commonwealth of Independent States increased for the fifth consecutive year … … while the surge in FDI to developed countries was widespread. Overall, prospects for global FDI flows remain positive.